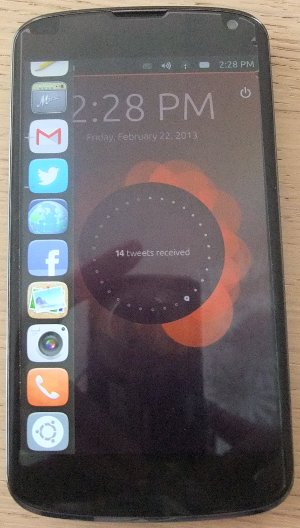 Yesterday, Ubuntu releases the first preview version of Ubuntu phone. There are only a few devices on which this can be installed, notable the Samsung Galaxy Nexus and LG Nexus 4 phones. I followed the installation instruction provided by Ubuntu to install on a Nexus 4. First off, installation is easy. The instructions are sufficiently detailed as long as you have a working Ubuntu system (no installations instructions are provided for the rest of the world). As my interest stems from long time Ubuntu use, this was no problem. The installation comes with some demo data (contacts, conversations and photos) and a lot of mocked stuff like applications, video and music. It looks and feels nice but there is still a lot of work. A lot of interactions are done by swiping from the edge of the screen. The left edge is used to select and launch new applications. The right edge allows you to switch between open applications. Swiping from the top allows you to select the notification icons. Most notably to select the “messages” overview. It is quite finicky to select the sound/wifi/battery/time notification icons. Swiping from the bottom show a (quick) menu for the current application. Swiping until you are on the hourglass allows you to get a larger menu (including the option to close an application). The release notes includes instruction about removing the sample contacts, pictures and videos. Removing the mockup applications did not work for me and I see no details about removing the conversations from the phone application. It all looks very promising, but this is very clearly a preview version. When putting pictures on the device, the images in subdirectories are not recognized. Just copying music or video to the respective directories is not yet automatically recognized. The keyboard is currently very simplistic. For example, a more appropriate keyboard could be shown when entering phone details in the contacts, the characters should change between lower and upper case depending on whether shift was pressed, sometimes it is impossible to get rid of the keyboard to allow showing the menu, the enter key seems not to be usable to confirm the value in a field and I don’t know how to move the cursor in the field (specifically when the information is larger than can be displayed). The camera application is mostly usable though there are some inconsistencies. You cannot zoom in/out by pinching two fingers, the flash does not work and I have had reappearing deleted photos and once where the photo of front and back camera were overlaid in some way. The home screen (as show in the picture above) only appears when starting the phone. I not found a way to get that back once something else was displayed. The only options seems to be pressing the power button twice. The volume buttons do not work. The browser is functional and this is also used for some other applications like twitter, gmail and facebook. It unfortunately does not yet include the feature to install a page as application like firefox does on desktop Ubuntu. This may be related to Ubuntu phone being based on Ubuntu 12.10 while this feature may have been introduced in more recent versions on the desktop. The actual phone application I have not yet been able to test (my SIM card is the wrong size for the phone). All in all, I am looking forward to seeing the progress on Ubuntu phone.